When I saw that The Oak Barrel had this Bunnahabhain Moine in stock I had to get it. 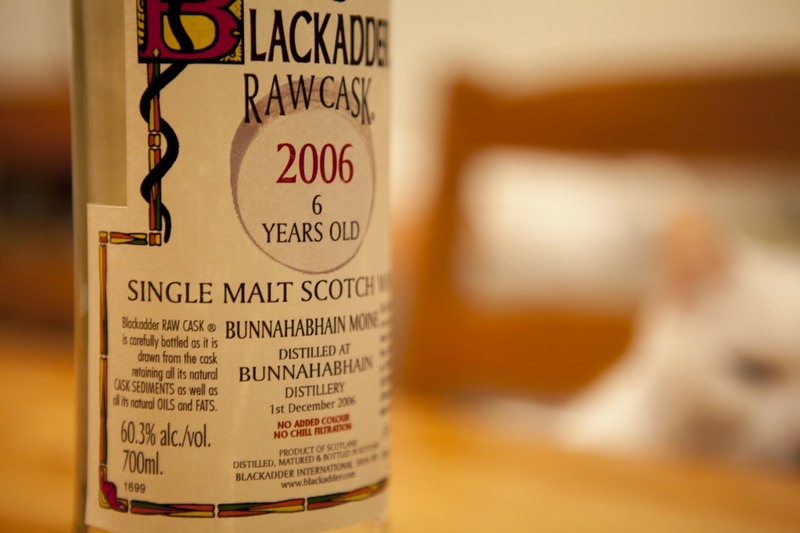 I had been waiting a while to try a Blackadder Raw Cask bottling. According to the Blackadder website they evenly divide the cask sediment between the bottles for whiskies in their Raw Cask range. Quite nice really and I didn't mind when I got down to the last dram and had a bunch of floating charcoal in there. I'm not sure if it has much of an effect on the whisky but I'm willing to invest more time trying to figure it out! Nose: Green vegetation, malt, and meat. Peat but not smoke, very earthy. Lanolin. Medicinal. Palate: Sweet on first contact then a brine explosion. Mouth full of seawater. Then turns medicinal, with tar and orange zest. Finish: Long finish on this one. Oily and mouth coating. Marzipan and salt, heavy earth, and orange zest. Legs on this whisky are amazing! Swirl your glass around a bit and check it out. Sublime stuff. Starting to find I have a taste for the peated Bunnahabhain whiskies. My partner thoroughly enjoyed this one too which was an unexpected surprise, nailing the tasting notes while she was at it. Music to go with this whisky is from a Japanese group called Depapepe. A colleague of mine told me about them a few weeks back and since then I've been going through all their albums. Fantastic chill out music.